The Duke and Duchess of Sussex stepped out this evening for a gala performance of 'The Wider Earth' in support of The Queen's Commonwealth Trust and The Queen's Commonwealth Canopy. The Duke and Duchess arriving at the Natural History Museum. 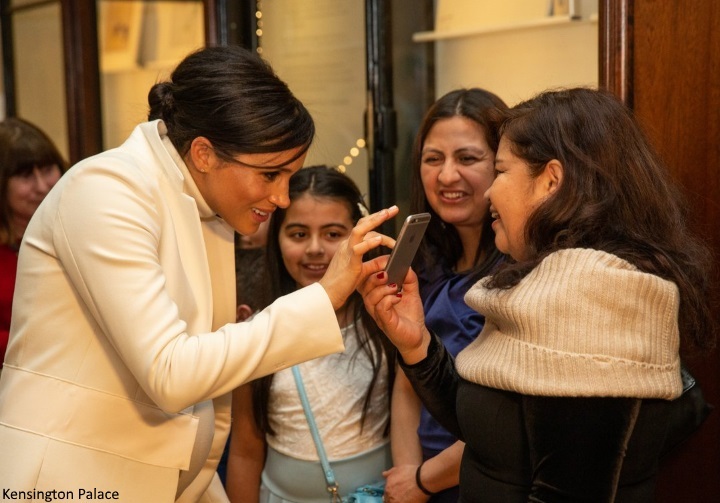 The appearance marks one of several productions Harry and Meghan have attended in aid of charitable causes close to their hearts. We've often discussed the importance of Commonwealth work not only abroad, but the value of efforts at home promoting initiatives and supporting fundraising efforts. 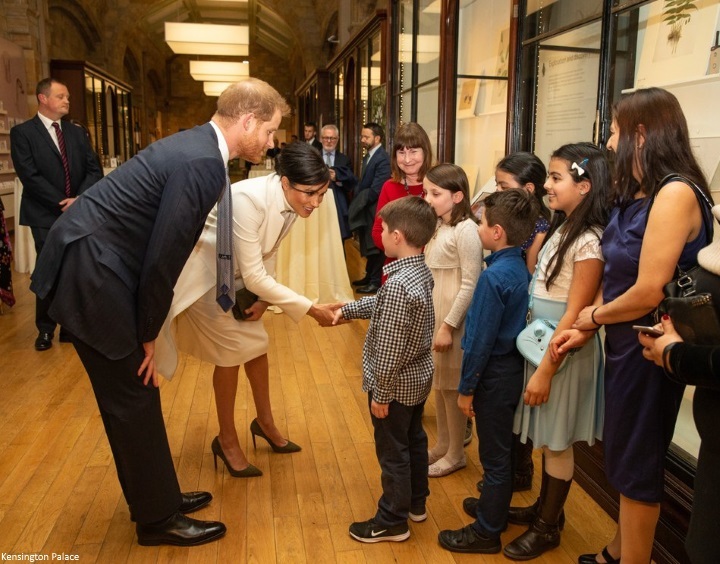 Harry is President of the Queen's Commonwealth Trust, which uses its network, platform and experience, together with the collaborative input of like-minded foundations and supporters, to enable young leaders to realise their dreams and hopes for the future. The Queen’s Commonwealth Canopy is a unique network of forest conservation initiatives that marks Her Majesty's service to the Commonwealth and conserves indigenous forests across the globe. It will create a physical and lasting legacy of The Queen’s leadership of the Commonwealth. This means a great deal to Her Majesty who said she has been "especially touched" by the project. 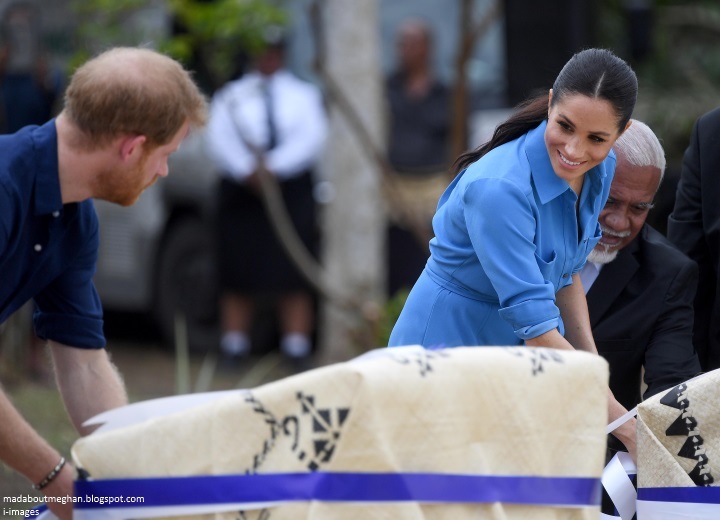 During their recent tour of Australia, New Zealand, Fiji and Tonga, Harry and Meghan unveiled six dedications to The Queen’s Commonwealth Canopy. 'The pair are well acquainted with the venue in Kensington, London, as it is where they are said to have enjoyed an after-hours date . 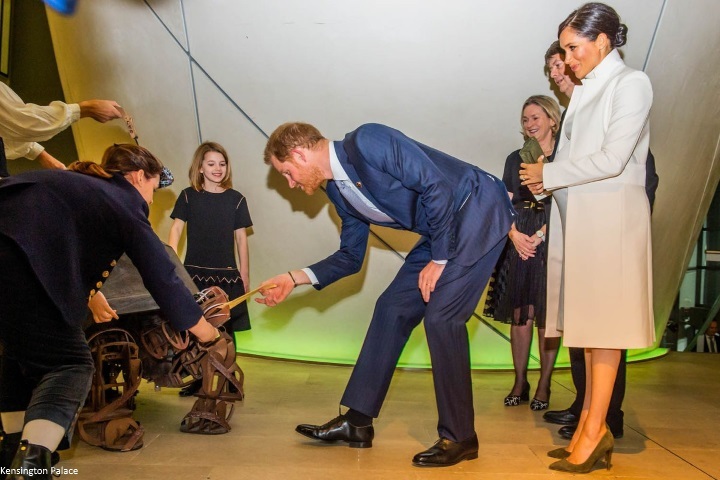 In March 2017, Harry reportedly booked out the entire museum one Sunday and slipped in after it had closed to take Meghan for a private tour. A source said at the time: "Meg had always wanted to go so Harry arranged a private visit. It's quite romantic after dark as all the exhibits, including the dinosaurs, are all still lit up. And of course, they had it to themselves." They were delighted to meet a group of children from Urbanwise London. The charity specialises in offering outdoor learning opportunities for children and delivers environmental education sessions for schools. They met with representatives from the museum and viewed Darwin treasures on display. Meghan chatting with a group before the show. She appeared impressed by a photo one young lady showed her. 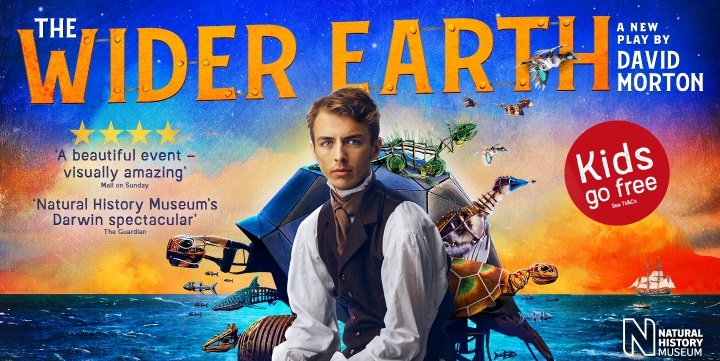 'The Wider Earth' is a critically acclaimed theatrical production about the young Charles Darwin’s daring voyage on HMS Beagle to the far side of the world. 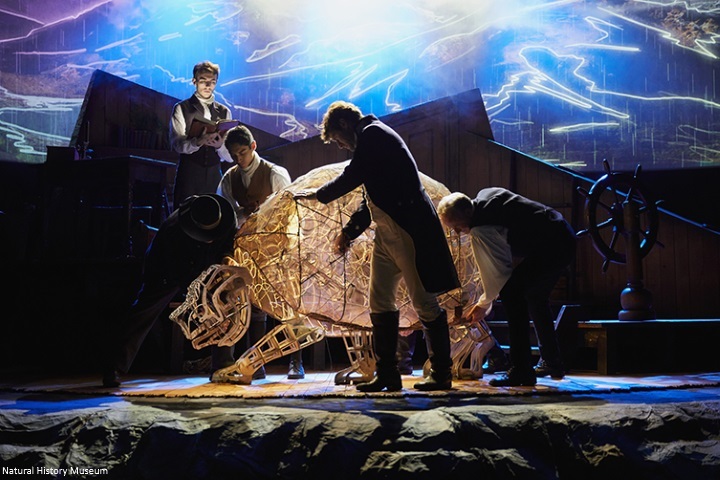 The production features a cast of just seven, outstanding puppetry, an original score and cinematic animations to bring to life uncharted landscapes. Reviews have praised 'The Wider Earth', calling it "An engrossing spectacle. Visually terrific. ", "Like a puppet version of Blue Planet" and "A great day out for all the family". It's the first production staged at the Natural History Museum in over a century. 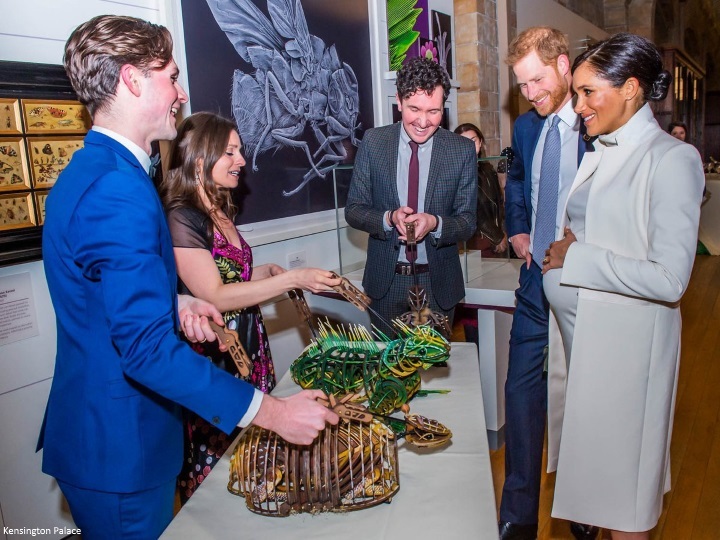 Harry and Meghan enjoyed a closer look at The Wider Earth puppets with creators Nicholas Pain and David Morton. 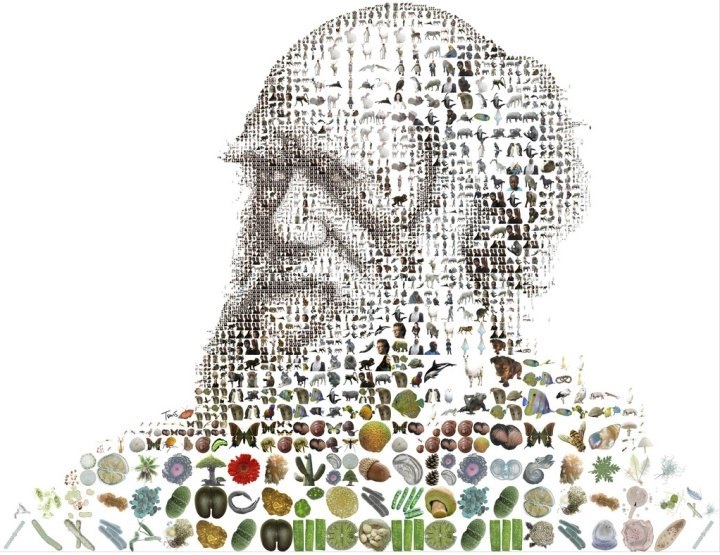 Tonight's performance celebrates the 210th anniversary of the birth of Charles Darwin. The English naturalist is best known for his work on the science of evolution. Darwin first theorised that all species of life have descended from common ancestors in his 1859 book On The Origins Of Species. His groundbreaking work is considered one of the major foundational blocks in science. While on HMS Beagle, Darwin proposed a theory of how coral reefs and atolls formed. Darwin suggested that atolls originally grew around extinct volcanoes which then sank into the sea, leaving the reef an isolated circle. 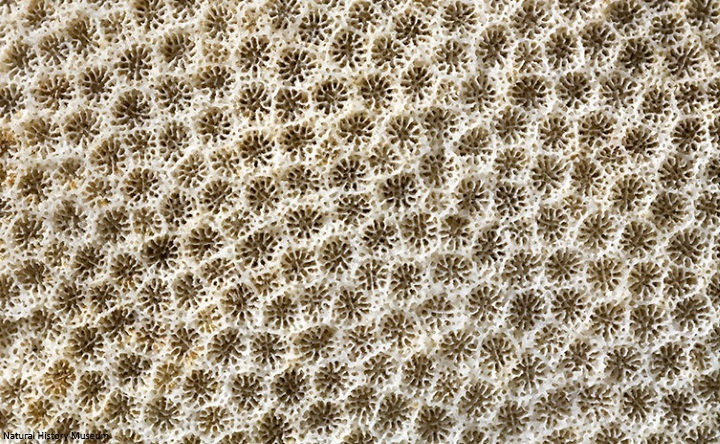 Several of his specimens are now preserved at the Natural History Museum, including the Porites coral collected from the Cocos (Keeling) Islands in the Indian Ocean. Indeed, the Natural History Museum's Library holds the world's largest concentration of Darwin works. It has 478 editions of On the Origin of Species in 38 languages including a rare first edition from 1859. The Duchess looked radiant in a cream ensemble with olive green accessories tonight. The tailoring and styling of the look combined with Meghan's updo made for a very retro, sleek, sophisticated look. It's one of her best maternity looks for me thus far. Readers will recognise Meghan's coat as the Amanda Wakeley Sculpted Coat she wore for the Commonwealth Day Service last March. The $1,190 piece is described as "A pristinely cut coat will pull your entire seasonal wardrobe together, and none come more elegant than our sculpted tailoring Crombie coat." It's available in limited sizing at Orchard Mile. Meghan's cream Calvin Klein roll neck dress appears to be a custom piece based on the Resort 2019 style shown below. The Duchess accessories with her Vanessa Tugendhaft Precious clover earrings. And Meghan completed the look with her green suede Ralph Lauren clutch and matching pumps. Michelle from Perth Fashion notes the pumps are also Ralph Lauren. She wore both pieces for Prince Louis' christening. 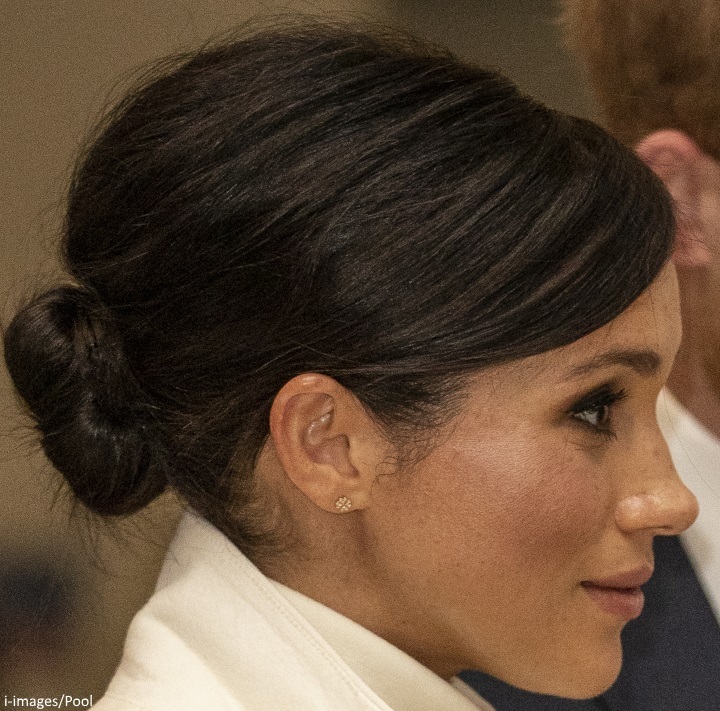 A closer look at Meghan's hairstyle. 'It's been one of those weeks for the Duchess of Sussex. A heartfelt letter which she sent to her father following his failure to attend her wedding has been released for the world to pore over, impressive calligraphy and all. Before that, a group of her closest friends decided to speak with People magazine to “stand up against the global bullying we are seeing and speak the truth about our friend”. And then on Monday night, George Clooney- Hollywood star and friend of the Sussexes- joined the fracas, saying that Meghan was being “pursued, vilified and chased” in the same way as her late mother-in-law, Diana, Princess of Wales. Against that rather fraught backdrop, Meghan could have been forgiven for not overthinking her look for a gala performance of The Wider Earth at the Natural History Museum. Instead, she used her style choices to depict a statement of power and peace. I expect we'll hear the itinerary for Harry and Meghan's Morocco trip shortly. She looks stunning and glowing as though lit from within. Such a simple outfit, but so lovely. I'm just so happy to see her, and Harry (can't tell if that is "Windsor blue" or a darker, nicer shade), but the white is beautiful! Pristine yet rich, like very fattening ice cream. Love the shoes and clutch -- looks appropriate for a show for adults and children. And rewearing already! Looking forward to the happy full post. Thought the same about the rewearing! Even though she's pregnant. She looks beautiful again. Gorgeous! Hair, dress, coat, everything. I love that she is dressed warmly this evening! Oh she looks lovely! I was just admiring my backyard covered in snow (I live in Vancouver Canada and we just got an unexpected few days of snow! ), and thinking that it looks like a winter wonderland. And then I see these gorgeous images of Meghan in her beautiful white coat and dress. She looks like a winter wonderland! Lol. And that's why I don't subscribe to the thinking that white or light coloured clothes (like her peach outfit) are only appropriate in the spring or summer. Mae, actually who does any longer takes care of appropriate colours for the season ? That’s so old fashioned and « petit bourgeois » , that sort of boring tradition such as light grey suits for bride and groom mothers .... just wearing a feel well clothe is far better, whatever the colour, the material, as long as we feel fine and comfortable in it .... looking at Meghan we can see it is the good way, she wears white in winter and she shines like a beautifull sun ! And she is so good at giving a whimsy twist to her clothes, here the green shoes and clutch , timeless elegance ! Nicole, I also found seasonal colours a strange concept at first, but years of royal watching has shown me that the British and spesifically the BRF definitely still have seasonal trends when it comes to colours. Like I say it is not something I subscribe to but I can see how an out-of-season colour can be strange on the eye for those who are used to sticking to the season. And they have a right to feel that way. I would consider announcing the results of a sono showing twins to be too invasive and not the world's business. They have to announce a baby because it's obvious. Imagine the craziness if they announced twins. Interesting that Clooney stood up for her, and they have twins. Allison, George Clooney stood up for Meghan because he is her friend and because he believes in her. What does having twins have to do with anything? I think Meghan carries the baby so high because of her petite frame and her short torso, that's her figure. I'm very short waisted as well, showed very early and the bump looked so big lots of people were asking me about twins. I don't think KP would have said "the Duchess is expecting A baby" if she was having twins, I think they would have just said "the Duchess is expecting" and be more vague. I agree. The green accessories are perfect with this elegant look. This is in my top five looks for Meghan. Keep it up Harry and Meghan, hold your heads up, look forward to the baby and keep doing your bit for the royal family. She looks stunning, beautiful and breathtaking. Love this outfit--it is very classy! The color is great on her and her makeup and hair are spot on. As others have stated, she is glowing. I also like the splash of color that her shoes and bag add. I hope she has a wonderful engagment. Oh, she looks fabulous! Is it just me, or does she look a bit tired in the first couple of photos? I'll have to wait to see the rest of them. I hope she's getting enough rest with everything that's been going on, not to mention being pregnant! I think her face is just getting fuller. I actually thought her fuller face looks quite lovely and glow-y. I thought the same of Kate's fuller face when she was pregnant. Her face looks . bit fuller but she still looks beautiful. There also appears to be less belly clutching and hand holding and I wonder if this is a new approach as they have been criticized a bit for these gestures. More professional today. I still think she looks beautiful -- I don't think Meghan is capable of looking bad lol! This is a really beautiful look. I love a turtleneck with a low bun. She looks lovely. 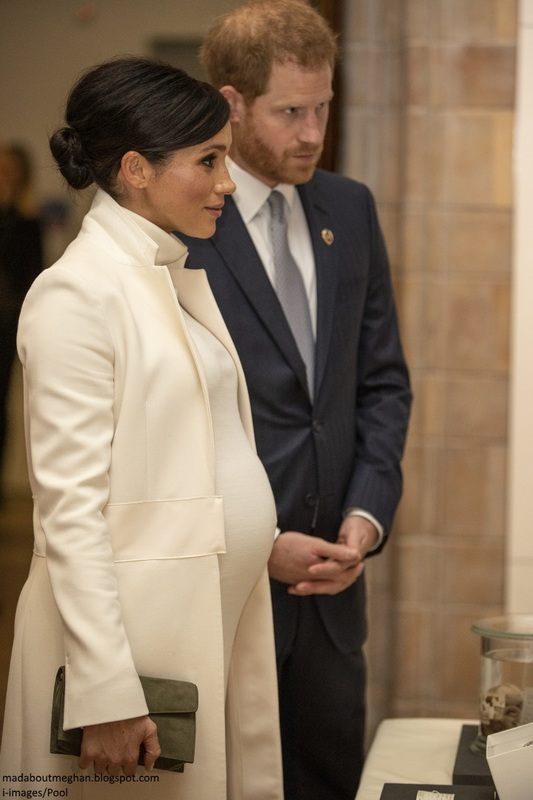 Fit is a little off (maternity clothes, Meghan, please!!!) but I’d say her best maternity look yet. Stunning! I also love the green accessories! Wonderful out fit. I really like the green with the white. Doesn’t Prince Harry look like a ginger James Bond in his suits. She looks ready to pop. 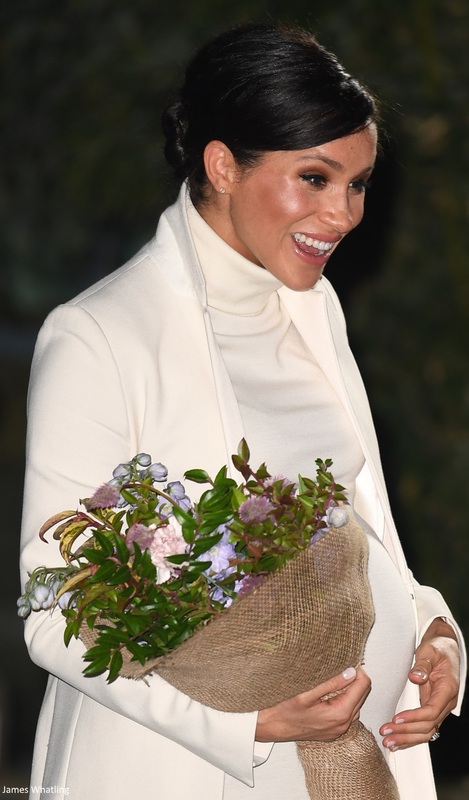 I love Meghan’s hair and her winter-white ensemble. Harry also looks very handsome in that dark blue suit. Yes, loving this hair style! The extra volume in the back makes the bun look perfectly chic while a bit retro. She looks fantastic. Wow! She looks stunning. Can’t wait to read the full post about the engagement. I really like this look. Glad the coat got another outing. The accessories add color without being too bright (even though bright is fun too!). Fit is a bit off with the wrinkles around the belly, but this is by far the best of her “maternity while not being maternity” looks. The fit is really just nitpicking since while I was pregnant I wore maternity and I just don’t think designers know how to dress a pregnant body as well as maternity brands do. But again that is a nitpick. She looks gorgeous, I on the other hand broke out like crazy when pregnant and did not have that glow she has. Pregnancy really suits her. Look at that tummy! Love it! Love her in cream. The dress and coat are beautiful! Her hair looks beautiful and elegant. I love how she chose the olive shoes and purse. Great combination! She looks tired to me, poor woman probably hasn’t been sleeping well, plus being pregnant on top of the stress. I hope she knows that so many people love and adore her. Beautiful look. I also love the green with the winter white. I like this looks overall. Think she looks great. Loving that its not black. They both look wonderful. I love the olive accessories with this beautiful winter white. Never a fan of the tight clothes, but she looks spectacular tonight. She looks stunning! 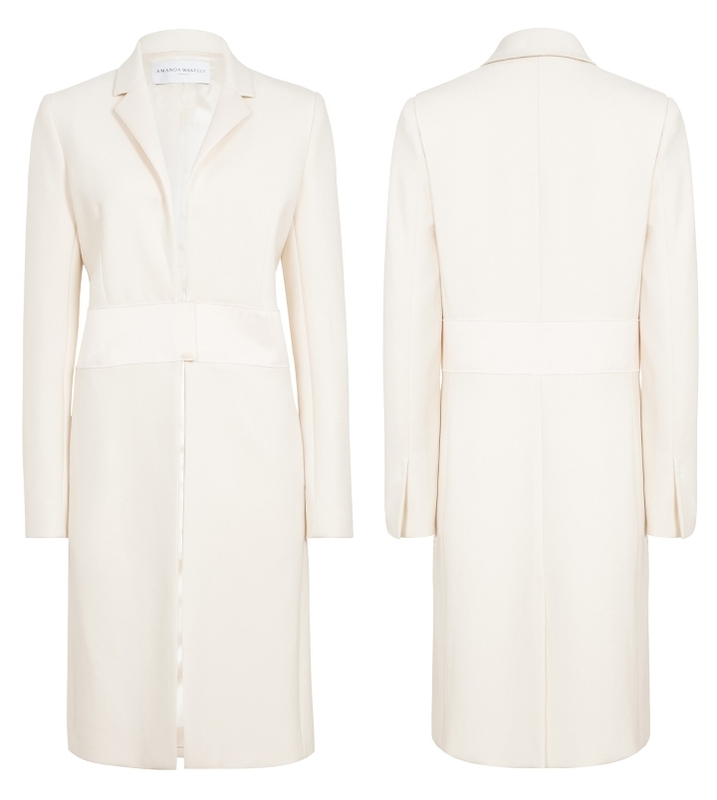 The rolled neck on the ivory dress with the coat is perfection. This dress fits - and suits - her so well. Perfect ensemble with a colored shoe/clutch. Her hair is so chic, would like to see the back of it. Very Audrey Hepburn. I do hope that it's twins. This is definitely my favorite maternity look of hers. I love the cream with the green accessories, and the glow she has. She does look a bit tired but I think she's getting to that phase of pregnancy where the baby is probably kicking all the time and demanding a lot of food and energy. I am glad she;s out and about, doing the things she does best, even with all the negative articles. She looks gorgeous and happy. For someone that was on that band wagon with "why doesn't she wear colorful clothing" - I really, really like this outfit. I agree that she should really invest in some nice maternity pieces, but she is stunning in this outfit. Harry - handsome as always!! I'm also looking forward to the rest of the post. Thanks a million Charlotte!!! There is a difference between a dress designed with a pregnant body in mind and a designer adapting a regular dress to fit a pregnant body. I agree that this dress won’t fit anybody that is not pregnant, but I would like to see her in something designed for a pregnant body. High end designers very seldom dress pregnant women so they don’t always know what will work. Having said that, I still think this is her best outfit yet. I love her look, love the color, the style, however it doesn't look like a maternity cut to me. The only improvement I would make is for the dress to not be so tight. I think if Meghan got some high end maternity clothes, the cut would be better. I also agree that this is her best outfit yet. The hair, accessories all perfect!! Glowing mummy to be. God bless her and her wonderful husband💖💖💖﻿This is the best way to respond to all the jealous, hateful and bitter detractors ! Really like her hair and accessories. Meghan is radiant! Love everything about this look & that colour on her! What a wonderful event! She just keeps shining with positivity! Stunning! Her face has been slowly getting a bit fuller, skin still glowing - gorgeous. She's carrying high - boy? Cool exhibit/event too! Hello belly button! I love her in white, I wish I could pull it off the way she does. Not a fan of the updo, it seems a bit formal and stuffy. I have to agree with you penny, not a fan of the updo. she does look good in this cream!! I think she looks lovely with her hair in a side part and updo. I really like her outfit tonight. I would love to be able to visit the Natural History Museum and the play looks interesting. Cream is definitely Meghan's colour. Wow! She's glowing. She looks beautiful. The Duchess looks stunning she is such a trooper I admire her resilience through this difficult time. I lthink she does look tired & her eyes are definitely puffy. The baby is high but she is short wasted & in first time mums the head doesn’t drop into the pelivis till around about four weeks before delivery & she still has awhile to go apparently. This is a sensational look on Meghan. The winter white and green, so cheering on a cold winter's evening. Harry also looks very handsome. The suit seems to be a darker/deeper blue than he usually wears and it is very nice. I agree with so many others she is just glowing and radiating light from within. She did look a little tired in some of the pictures but it's most likely that as soon as her head hits the pillow Baby Sussex decides to kick, move around, feels it's playtime. It's hard to sleep when it feels like baby football is going on inside you. They are such a beautiful couple, both of them always smiling at each other and the people around them. I can't wait for the mini Morocco tour. I think Meghan looks great. I love this white ensemble. My heart aches a little though, as I think the puffiness of her face and eyes may reflect tears shed. Sending good energy to her and Harry. They are an inspiration. I thought the same thing. My face and eyes always get really puffy when I’m stressed and crying. Meghan still looks gorgeous (unlike me!). That's what I was wondering too, or tiredness after this past week's events. As others pointed out, however, it's likely her face is simply fuller due to pregnancy. Add my admiration to everyone else's... the winter white with olive green accessories are positively stunning. The bunching and pulling around the tummy are unfortunate, but it's for a very happy reason, and overall Meghan is as stunning as ever. Another wonderful engagement to bring our attention back where it belongs! Not only do I love the fashion, accessories and hair, but the Duchess' glow must bring the most joy to all who were there. Onward, indeed. Love this whole outfit, very Audrey Hepburn in my eyes. I was thinking Audrey Hepburn too, before I read your comment! The Duchess of Sussex looks fabulous. I’m glad that she is so strong on the inside; great fortitude. Lovely bouquet of flowers. I watched the Darwin short video; looks very interesting. Thanks, Charlotte for sharing. I know people have commented here that they get tired of seeing the Duchess in creams, but I think it's her best color. I think it shows off her flawless skin, dark hair and beautiful eyes perfectly. I LOVE her in this color. 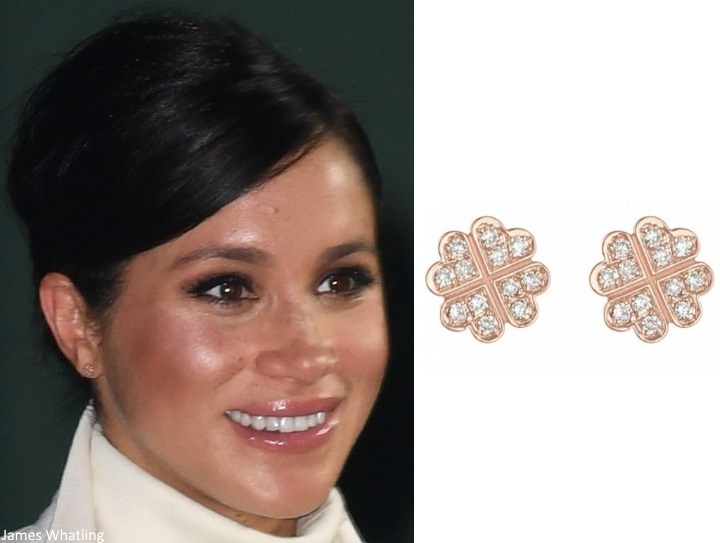 The clover earrings are darling and paired well in so many ways with the green shoes, clutch and the event they attended. The only criticism I have is that I get tired of all the "movements" talk. Did she really wear this color for solitude, "power" and peace or did she just like the outfit? I feel that some things used to make a statement, but now EVERYTHING is a statement and it is old, tired and done for me. Tonight she looked lovely, glowing and very pregnant! Joyous days are ahead! Tammy I so agree with you. I know royals, sometimes, use there clothes to support a cause or give tribute to something. But it is very frustrating when every single thing they wear is link to some cause. Sometimes it is just a nice colour. When fully considered, everything any person wears as well as how they groom themselves is a statement. For the majority of people it's an unconscious one; nevertheless, how they present to the world is a statement reflecting an inner state of mind. Sometimes it's also indicative of solidarity with others in a given group or common cause--everything from Wilde's green carnation button holes, national or team colours to woke white. On any platform, whether it's the way a person schleps around the house or how they present on a global stage, the look is an automatic, non-verbal message. I agree that constant headlines about such matters is old, and tired and done. People with any intelligence can work out the multiple levels of symbolism for themselves. But let's always remember that the author of the article is not the writer of the headline. That's someone else's job and that job is to generate click bait. While clout chasing royal pundits and gossipers whine on about Meghan and say she is a minor royal, for some reason they always have her on the front pages. While their articles may be full of whining, the photos of Meghan are flawless, always smiling because the pictures do not match the depressing narrative the Royal gossipers have preordained. Keep Smiling and Be Fabulous Meghan! Lovely look on the Duchess, love the olive shoes and clutch perfect choice of color. The only thing is I would like to see this coat with the collar turned down especially with the turtleneck dress. The collar did not bother me this time around, probably the all white outfit combined with the evening light. But when she wore it to the Commonwealth service, the fact that you could see the lining of the upturned collar did bother me. Btw, we should remember that some edema to the face is actually normal during pregnancy. Extra blood for the baby and some fluid retention needed to soften the skin for the purpose of expanding. So, she may NOT be tired nor crying. Thanks again, Charlotte. Thanks for the summary, Charlotte! It’s nice to see the Sussexes continued support for such a great cause. Harry & Meghan are a beautiful couple. Meghan looks fabulous & comfortable, love her entire look! She looked beautiful! Her entire look!! I mean that color really suits her! Brings out the makeup and shape of her eyes! She took today’s engagement with much dignity and grace after the horrid news broke out from the letter to her father. This is one if my favorite maternity looks as well Charlotte!! In some other news media, her dress shows her belly button protruding for some reason which makes me think that the dress is too tight around the belly area and should be made looser. She looks so beautiful. I love that she's not wearing black. Thank you so much Charlotte for your great blogs. Whether the colour of Meghan's outfit is symbolic or not, I love the cream and olive combination- it looks so elegant together. Meghan looks very chic, and her demeanor always gracious. I know that white is the colour of the suffragettes, and various high profile women have of late worn it to make a political statement, but does anyone know if there is some significance to green as well? It seems to me that when Kate wore green to Bafta instead of black to support of the "me too" movement last year, people were commenting on green as signifying something or other. Anyone know anything about that? sometimes a cream dress is just a cream dress. 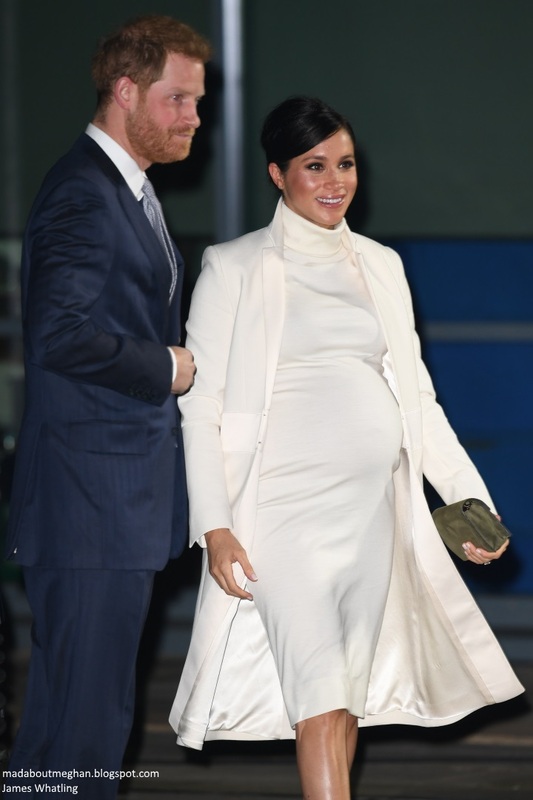 I absolutely love Meghan in a bright winter white! My only objection, and it's a minor one, is that the neck is a bit too tall and tends to swallow her chin, making her neck look short. But her beautiful smile, and handsome and solicitous husband, make up for any shortcomings in her outfit! I also have to admit that I am astonished both she and Kate are/were able to wear 4 in./10 cm. heels in advanced pregnancy! My feet swelled up so much in both my pregnancies that I couldn't wear any heels at all, so I am just boggled at these women wearing such high heels while their balance is changed so dramatically! Meghan clearly has benefits from her yoga that are good for her balance, far beyond her lovely posture! The museum is a great cause to support, too. I wonder if the play will ever be videoed for those of us unable to see it live? I do hope so! I appreciate how much support Harry and Meghan are giving to causes so close to the Queen's heart. I'm sure Her Majesty does, too! Ultimately, Meghan is a strong woman, and it glows from within her. I always smile when I see her -- she is so positive in her interactions with the public! I know Harry is making sure her life is as happy as possible, too, and his clear adoration of her and attentiveness to her is clear in every photo. She and he are building a happy life together, and I know that she will make the Royal Family proud for many years to come! Incredible, just incredible! Once again I’m so impressed by her style and grace. Just deliciously chic, this creamy ensemble is the perfect, simple look that is sophisticated and also totally modern. Great color for the accessories too, love those earrings, the HAIR is gorgeous, and can we talk about that ultra cool nail color? And all this while helping those in need and moving past her very public family pain. She really is amazing. And so beautiful! Meghan looks amazing. Perfect outfit. I do think her eyes look a little ‘heavy’ But her smile is truly radiant. I do agree with Tammy, I wish folks didn’t read into every outfit and choice .... the whole ‘paying homage to X’ has gotten really irritating in the reporting of both Duchesses. Maybe they just like the outfit or combination. There’s not always an alterior motive to the clothes and jewelry they wear. It does feel like reporters are just making stuff up to create a headline. I agree. It’s getting ridiculous. We see that from almost all royals when they visit other countries or entertain guests at home but not for every ordinary outing. It feels like the press and fans started to make this up more and more for the last 5 years. Latest crazy assumption- Kate wearing „Prussian blue as nod to Germany“. Too sad no one in Germany got it as it’s just not a thing here. So either she was ill advised or, more likely, just wore another outfit in her favourite colour blue. Meghan is carrying high! It’s a girl folks! Well, you have 50/50 chance. So happy to see Meghan looking so radiant despite the recent drama her father recently created. She just beams confidence, grace and joy. Whether she wore them color to seem pure/innocent despite her father’s antics, for a suffragette homage or just because she enjoys a winter white. I love it. It looks so great on her skin tone. And I enjoy the color blocking of the moss green shoes and handbag. Sometimes I wish she would wear a chunky statement earring (it could still be simple) but I know that’s not really her style. Regardless, she looks like perfection. I hope for her sake her family would give her some peace. But I think she and Harry seem very happy and an excited couple about to expand their family. Also love that this was a theatre event. Very in Meg’s wheelhouse. But also about educating children! I’m looking forward to see what she will wear to Morocco. The Duchess looks incredible. A lovely healthy glow. Gorgeous outfit. Geez does she ever look bad? Haha. I call her a pregnant goddess. Amazing as usual, LOVE this look! She looks beautiful, she is carrying normal for an April delivery, the baby will start dropping in March then we should have an April birth. It’s already halfway through February, she has plenty of time to drop before the birth. Seen by itself, the things the media publish (not talking about the completely rediculous mags that had Kate pregnant 40 times, crowned at least 20 times and often feature HM and Camilla in a druken brawl) is fairly standard speculation on high profile public figures. It might often be untrue but that does not make it harrassment, bullying or slander. And as public figures they have to be very careful not to look like they are suppressing criticism. Hence no legal action can be taken. The media are very careful to stay within the legal boundaries. The fact that what they publish entice a certain group to harass and bully Meghan in the comment section and on SM is a different story. But I don’t think the laws have caught up with that. I know William do sometimes get his lawyers to send threatening letters and I have heard rumours that Harry has done so a few times in the past year as well. Taking it to the courts on the otherhand has the downside of attracting more negative media attention and being more devisive of public opinion. They won’t take the chance unless they are 100% sure they would win. If there could be any argument for “freedom of speech” or “in the public interest” taking it to court could backfire. That’s my friends son shaking Meghan’s hard! Oh so sweet!! This look is very elegant. The combination of off-white and olive/khaki is stunning. And I like that she is rewearing this wonderful coat as well as the clutch bag and shoes. It is not necessary to wear always something new because you can combine clothes and accessoires in a new way. I would have appreciate it if she would have worn tights because legs look definitive better with tights. I, for one, am happy to see Meghan wearing pieces from her closet, even if they are not "maternity" clothes. Yes, you need to wear clothes that will accommodate a growing baby, but investing in a wardrobe that will only fit you for a few months seems frivolous if you have items (like this beautiful cream-colored coat) in your closet that work perfectly well. Meghan glows in this ensemble and I liked her updo. As always, my own style would dictate larger or more statement-like earrings with a rather simple look such as this. But since her style calls for smaller pieces, I think she made a good choice of earrings. The combination of olive and cream look lovely on her. She looks gorgeous, as always. But I really don't think that turtleneck is doing her any favors. It makes her face look a lot fuller than it is. I just want to send my compliments to the floral designer of Meghan's presentation bouquet. The burlap wrap was a nice touch for this particular event. Praise where praise is due. I find Meghan wearing more and more looks I really like. Love the whole ensemble. Now, that is the perfect balance between Buckingham and Hollywood. Love the repeats. She did positively surprise me with some of her latest choices. Maybe I will end up being a fan of her fashion sense after all? I think it's asking rather a lot of a woman to do a tour, although a short one, and Morocco is not that far away, at this stage of a pregnancy. She'll be entering the uncomfortable stage. I know Kate did a Scandinavian tour, but I think Meghan will be a month or so more later in her pregnancy than Kate was. Morocco is a lovely country to visit, and I think it was one of the countries on Michelle Obama's "Let Girls Learn" tour, and I believe she took her daughters with her. Hope she's comfortable enough to really enjoy. Meghan strikes me as one of those people who are always in the moment. The fact that they announced this mini tour so late, makes me think that Meghan wanted to see if she will feel up to it. Otherwise Harry would have gone alone. So I think the fact that she going along is good news. When the letter was released, I wondered if Meghan would like to see her friends in the Hubb group. Then I read that she made a private trip to see the ladies on Wed. afternoon. I imagine they gave her friendship and helped her gain perspective. Then I see a headline saying that Princess Charlotte has friends in school. And I thought how that is absolutely no one's business. And I felt sorry for William and Kate -- they have such an amazingly privileged life but they have no choice. They can't change careers in midstream or retire early. It's a difficult situation. It must have been easier before cellphones; now every movement is instantaneously transmitted around the world. Fabulous blog for fabulous Meghan, aka Sparkle, as my sisters and I call her! Thank you, Charlotte, for this wonderful blog. Have you thought of jumping on the Instagram bandwagon? I appreciate all the work it takes to cultivate this fun community, and just wanted to throw out the Insta inquiry... Keep up the great work! Have you seen this? I think it would be worth a post before the mini tour. What do you say? The NY Daily News had an article about Meghan being in the City. And, if she's having a baby shower, I hope she gets lots of cute little onesies for Baby Sussex and that she has a good time even with the freezing cold.